Lloyd Kerry says that Harrogate Town are still confident of achieving their goal of securing a National League play-off spot, despite a run of three games without a win. Simon Weaver's men have collected just a single point from the last possible nine, losing out 1-0 to Barnet and Salford City either side of a 2-2 draw at Barrow. That dip in form has seen the club miss out on the chance to move within touching distance of the top of the table, though they are still well-placed as far as the battle for a play-off berth is concerned. 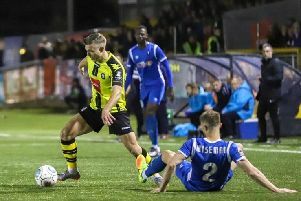 Town sit sixth in the National League, five points ahead of eight-placed Ebbsfleet, and head into Saturday's clash with struggling Maidstone United intent on consolidating their spot in the top seven, according to Kerry. "We've got six games left, and each one is a cup final, really," the former Chesterfield midfielder said. "I don't think that anyone outside the club expected us to be in this position at this stage of the season, but we're still confident that we can finish in the play-offs. "We've done so well this season and we want to see it over the line and cement our position. We don't want to throw it away now. "We're a determined bunch and we believe in ourselves. We've only taken one point from the last three matches so we need to get a result against Maidstone." Saturday's opponents are in grave danger of relegation to National League South following a season of struggle. The Stones find themselves second-from-bottom of the pile and 16 points from safety having lost six out of their previous seven in the league, failing to score a single goal in any of those defeats. And although United's fate will indeed be sealed this weekend if they lose to Town, Kerry insists that he and his team-mates will not be taking their opponents lightly. "We definitely won't underestimate Maidstone, there are no easy games in this division," he added. "They might be at the wrong end of the table, but they've got some good players in their side. "That said, we believe that if we play to our maximum then we'll win the match. "We're a good team when we get the ball down and hopefully we can do our stuff on Saturday. When we reflected on the Salford game we felt that maybe we played into their hands a bit by playing too many long balls. We want to put that right this weekend." Kick-off at the CNG Stadium on Saturday is at 3pm. For live updates and post-match reaction, follow @HarrogateSport on Twitter.